Petty Officer 1st Class Kelly Parker | USCG-17th District Apr 22, 2016. An MH-65 Dolphin helicopter flies near the Coast Guard Cutter Munro in the Bering Sea, Feb. 18, 2016. Having a deployed Dolphin aircrew is just one of the many capabilities the 378-foot high endurance cutter has to offer while on patrol in the Bering Sea. 94th Airlift Wing-U.S. Coast Guard photo. KODIAK, Alaska — The Coast Guard Cutter Munro crew returned to Kodiak, Alaska, after a 103 day deployment Sunday. 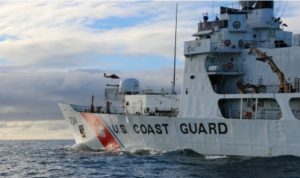 The Munro crew left Kodiak on Jan. 5, 2016, and spent 31 days in San Diego, California, for a bi-annual operational assessment, returning to Kodiak briefly on Feb. 5, 2016. The crew of Munro was assessed for and received excellence ratings for their competencies in navigation, seamanship, engineering, electronics, damage control, warfare, gunnery, medical, and communications exercises. The Munro crew returned to sea Feb. 11, 2016 for a winter Bering Sea Patrol. During the next 66 days the crew ensured the safety of life at sea, visited St. Paul Island and Port Hieden, conducted numerous community service events in Dutch Harbor, traveled north to verify the location of the ice edge, maintained command and control of an attached MH-65 helicopter on various flight sorties, and bolstered their law enforcement pursuit boat program. The crew earned numerous qualifications while on patrol, which contributes to the operational readiness to respond and assist with any distress in the Bering Sea. Visit DVids for additional images.